After reading the Mortal Instruments series by Cassandra Clare, I fell in love with warlock Magnus Bane. When I saw she had some Kindle short stories available about Magnus, I jumped at the chance to read one. 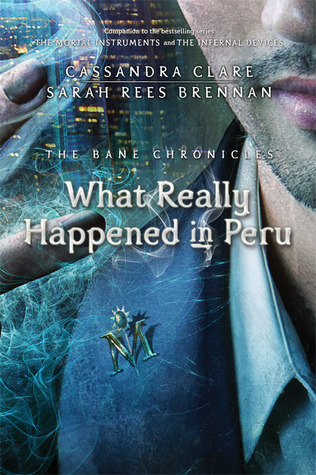 The first of the Bane Chronicles is titled What Really Happened in Peru. It is co-authored by Ms. Clare and Sarah Rees Brennan. I hate to say don’t waste your money, but well… it wasn’t good. The first issue was the formatting. Two different fonts. Then there were gaps in the text (I got lost as to what was happening) and then in other parts, when I would turn the Kindle page, the previous text would be repeated at the top of the next page. Annoying. While I did laugh out loud while reading this, it was more because it was so ridiculous than anything else. The Magnus in these stories (to me) was not the same Magnus who was in the Mortal Instruments series. He was flippant, almost spacey. There was very little mention of Downworlders and mundanes. This was definitely not what I was expecting. To this day, whatever it is that actually got him banned from Peru is – and perhaps must always remain – a mystery. Seriously. That is the ending line. ‘Nuff said.